Sixteen-year-old Lyla lives in a bleak, controlling society where only the brightest and most favored students succeed. 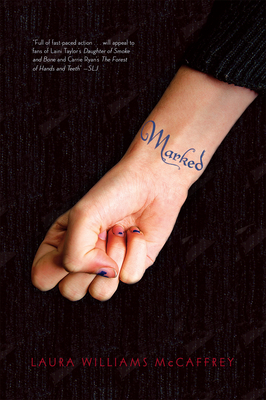 When she is caught buying cheats in an underground shadow market, she is tattooed—marked—as a criminal. Then she is offered redemption and she jumps at the chance . . . but it comes at a cost. Doing what is right means betraying the boy she has come to love, and, perhaps, losing even more than she thought possible. Graphic novel–style vignettes revealing the history of this world provide Lyla with guidance and clues to a possible way out of the double bind she finds herself in. Laura Williams McCaffrey is author of Marked, Water Shaper, and Alia Waking. She is on faculty at Solstice, an MFA in Creative Writing Program at Pine Manor College, and lives in Vermont with her family. Visit her website at www.laurawilliamsmccaffrey.com. "McCaffrey creates a world that blends steampunk with political intrigue in a faintly Celtic setting. Lyla is a flawed heroine who becomes endearing as she struggles to recognize the good guys in her life." "McCaffrey's society has a Dickensian feel to it, with a heaving, discontented underclass dominated by the barons who control the source of power and the inventors who wield it. An original, textured page-turner." "The strength of the characters, especially the strong female protagonist, allows teens to fully engage with Lyla and her struggles. Full of fast-paced action and ethical quandaries, this work will appeal to fans of Laini Taylor’s Daughter of Smoke and Bone and Carrie Ryan’s The Forest of Hands and Teeth. . . . top-notch characters and a cool premise."